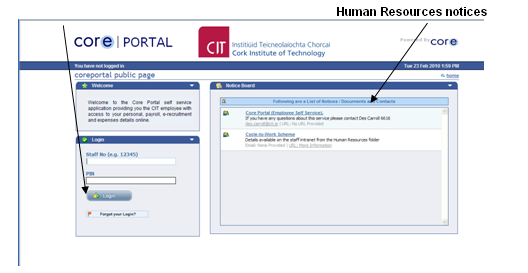 Core Portal is a new online self-service facility that provides CIT employees with access to HR, Payroll, Expenses and e-Recruitment details online. 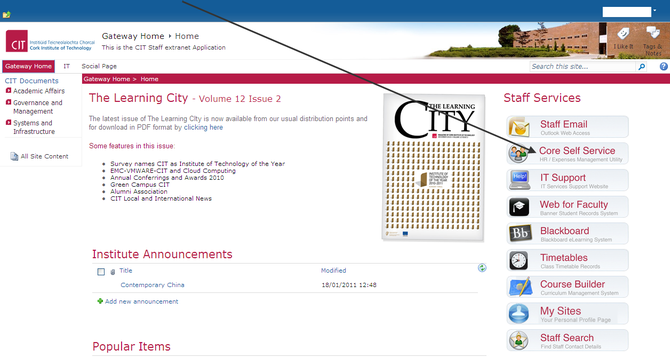 You can access the system via the CIT Staff Gateway (see below). Update your own personal detail information, e.g. contact details, dependents, next of kin, etc. To access Core Portal, launch a standard web browser, e.g. Internet Explorer or Netscape Navigator, and go to the CIT Gateway at http://gateway.cit.ie/ as shown below. Click on the Staff Core icon. For first time users of the Core Portal Application, please see the following starter pdf instruction manual. Enter your staff number (e.g. 12345) and PIN. When you log in for the first time you will be prompted to change your password. The password may be alphanumeric, 4 to 8 characters long, and must contain at least 1 numeric value. Enter your current or temporary password. Confirm your new password and click Apply Change. If at any time you forget your password, click on the button and a new temporary password will be emailed to you. You may change your password as many times as you like using the Change Password function under Preferences. A number of Core self-service portals are available throughout the college campus. These are currently located within the Open Access Lab and Staff Canteen. To fully utilise the Core Portal, please ensure that you use either Internet Explorer 8 or Mozilla Firefox to operate this application successfully. The use of Safari on a Mac will cause the application to hang. If you have any further queries, please do not hesitate to contact us.